"The hen savers are great! I'll be back to buy more. My hens say THANK YOU!" 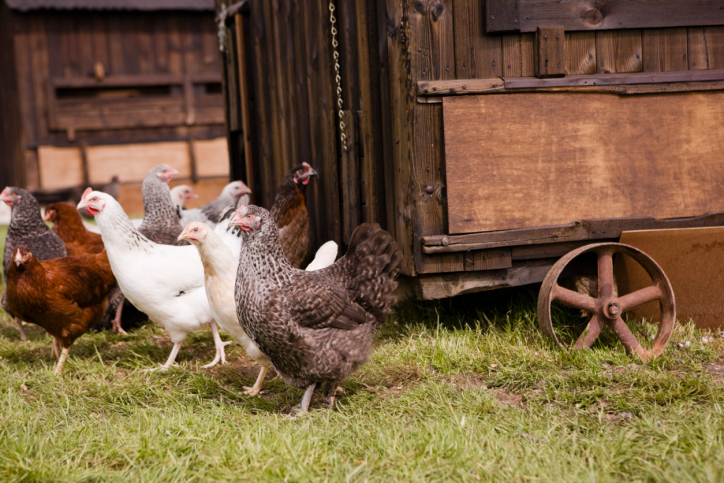 "The Hen Saver worked great for our hen Misty. After losing most of her back and shoulder feathers in a hawk attack, she never re-grew them due to other chickens in the flock picking on her. We saw the Hen Savers on the internet and decided to try one. The other chickens immediately left her alone and after only a week we could see new feathers starting to grow. Now after a couple of weeks she's covered with new feathers just in time for the cold weather here in Connecticut. 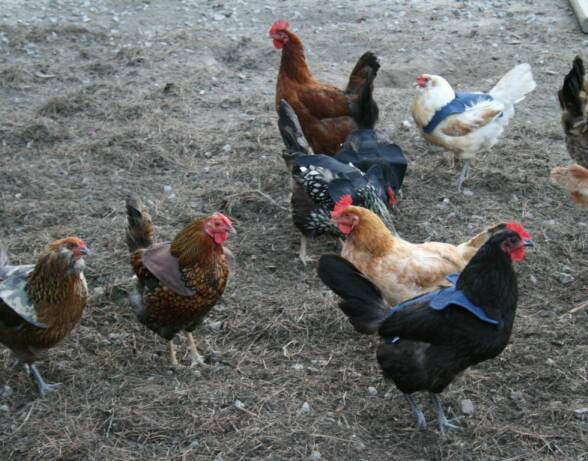 Not only did the Hen Saver work great but the people at Crazy K Farm were really helpful in finding just the right apron to work for us." "The saddles are absolutely fantastic. "Love the saddles!! Excellent product." "Thank you for selling this product." "I'm just so excited to find your Hen Savers, I'm just beside myself..."
"I received my hen aprons today. Much thicker than others that I have bought and they look SSSOOOOO good!" "Just wanted to let you know how pleased I am with my order of 2 hensavers. We have the most spoiled hens, but unfortunately our rooster has two favorites. I have tried twice to make them those covers, but the hens always worked their way out of mine, yours stay put. They're working great, protecting them from the rooster and also keeping them warm (It's been very cold and snowy here in Michigan.) Great product." "Just wanted you to know, I received my order of hen savers today. Thanks for the speedy response. "THE GIRLS" got their aprons put on and after the backwards circus was over, I can see where these will be just the ticket for them. One thing I noticed right away was how they fit so well that they cover the exact areas that had been worn and raw. Perfect also because winter has really set in here in Montana." "If you have chickens you need this Apron! 5 Stars." "Really enjoy the aprons. My little girls are at peace thank you for the aprons. They are now getting their feathers back. They really stay on. THANK YOU." "I want to thank you for coming up with such a great product -- I am very impressed with its high quality and durability. I bought some Hen Savers from you because our hen, Faith, who had lived through a bobcat attack (thanks to God for answering my prayers), was loosing feathers from our rooster and after her making it through her severe wounds from the bobcat, well I wasn't going to let her get scratched up and injured anymore! I also noticed her exposed skin was getting chapped from the cold winds and cold temperatures. Lotion wasn't helping enough and this coverage has made a world of difference. Thank you so much for this product." "You provide a fine product, and I will order from you again in the future"
"I just want to tell you that the first chicken apron I ordered has done wonders for my hen. At first she acted funny with her head down and other hens pecked at her head and chased her around the pen, but by the next morning she was walking around with her head up and prouder than she had been before. The apron looked like it belonged there and was doing it's job wonderfully. The brown color matched her feathers just right and I am so happy I found your product advertised in Backyard Poultry magazine! Thank you so much." "I wanted to write and tell you that I purchased three of your HenSaver saddles about a month ago. My hens' backs and shoulders were pretty bare from the rooster. After wearing the HenSaver for only a month, all three hens are growing their feathers back. It took about two days for them to get used to the saddle, but now they are completely comfortable with it. I'm very happy with your product and with the fact that it has saved my hens' backs & shoulders. All in all, a great product. Thanks again."